Featuring a tape form that is non-oxidizing to metals. 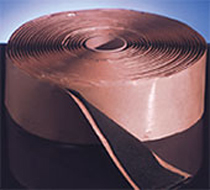 This superior product is a 40% cork-filled, non-curing butyl rubber tape. It bonds to metals, glass and plastics. As an insulating media on hot or cold lines – in refrigeration, freeze blocks, walk-in coolers and other applications.